‘Bridport TLC, not a load of rubbish‘. One of the first things that The Bull Marketing Manager Billy asked me to do for the Bull Blog was to talk to Leon. Thing is, it’s easy for a boutique hotel to talk about great food. But what about ‘behind the scenes’? Boring stuff like recycling… Come and meet Leon and his team of Bridport volunteers. They are anything but boring. Tucked away on the St Michael’s trading estate, between the artists and the antique dealers is Bridport TLC. Oh yes, Tender Loving Care. Very apt for a Community Project that does so much more than collect recycling from the Bull Hotel and many Bridport businesses. The reality of recycling is that we all want to do it but for a business it can be difficult to get all the staff to understand the importance of sorting things. That’s where Leon came in and explained to us all in his enthusiastic manner what Bridport TLC do. It’s so much easier to be responsible when it’s made easy for us. 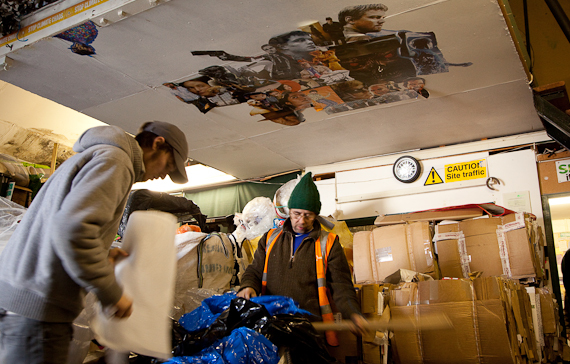 Bridport TLC, packing cardboard with artwork on the ceiling ! Bridport TLC started as a Community Biodiesel project set up by Leon Edwards and Tess Dickson. They collected local waste cooking oil and turned it into clean fuel, then went on to set up a Bicycle repair and recycling workshop and now collect waste from local businesses to help them meet the Government’s ‘Business Waste Directive”; among other things. The recycling hub is a hive of busy bees. I wouldn’t call Leon the Queen bee, he’ll never talk to me again, but he and Tess are very much the drivers that keep the project going; as with all similar ventures in times of financial cuts, it’s not an easy task. I’m told the boss is in fact General, the ginger cat that makes sure rodents keep away from the vast amount of potential food. The ground floor is filled with cardboard and plastic (among other things) waiting to be taken to a larger local recycling centre in one go. 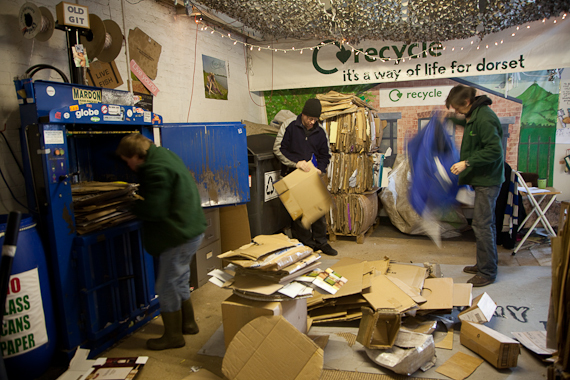 Volunteers collect, sort, bale and have a laugh. More importantly, they do a very worthwhile job. 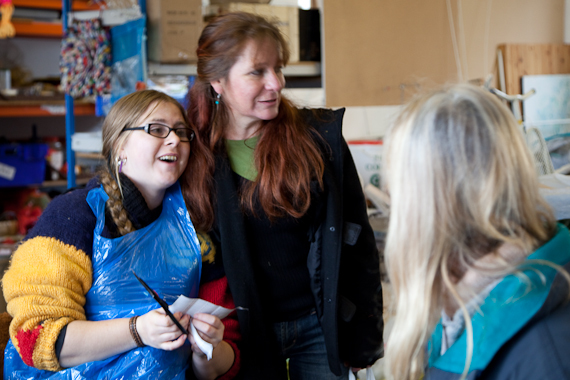 An important part of Bridport TLC is to help people with learning difficulties or who may have chosen the wrong path at some point in their life to integrate into society by volunteering to do a job the Community needs. What would we all do if nobody took that thankless task on board? 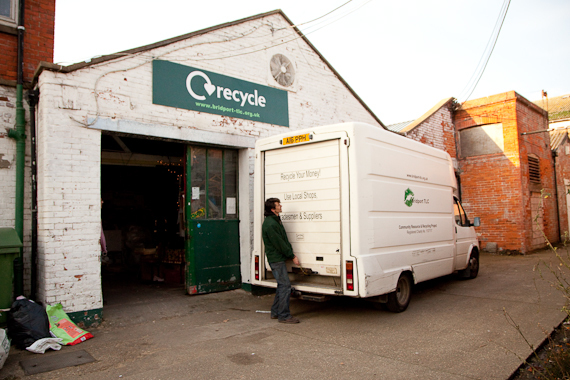 Waste not want not comes to mind when you have a look around Bridport TLC’s Scrapstore. What to do with all this stuff they collect? Tess is an Arts Project Worker whose work can be seen during Carnival. 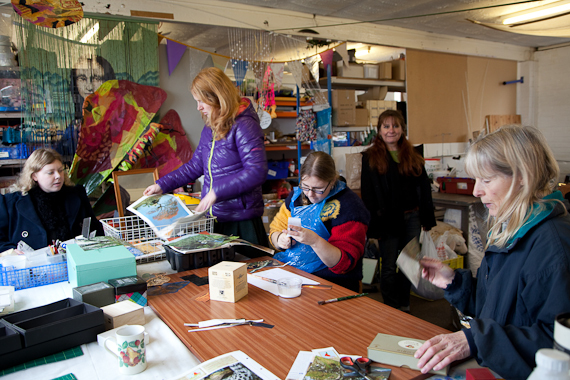 Weekly meetings ensure that people with learning difficulties can come and create some wonderful recycled bags, decoupage boxes or covered picture frames. The Scrapstore is open to the public (you have to become a member) and is an Alladin’s cave for crafts people who want to pick up some weird and wonderful bits of material, plastic tubes or cones, ribbons and of course rope and nets… What you’ll find very much depends on what has been collected. Sure gets the imagination going. TLC Scrapstore outlet in Bridport, St Michael’s Trading Estate, pick up a bargain ? 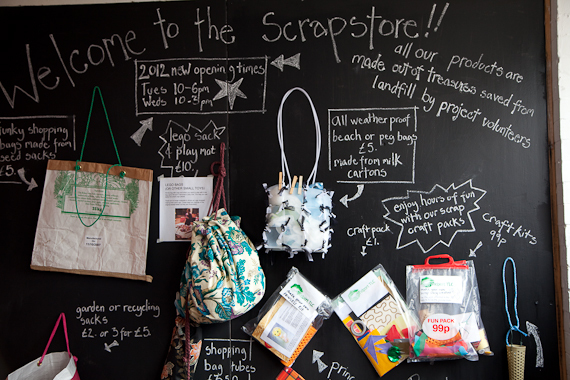 Bridport TLC recently opened the Scrapstore Outlet where items made by the volunteers are sold to help fund the project. Fancy a funky bags made from milk cartons for £5? A craft pack for 99p? A colourful lego bag that doubles up as a play mat for £10? What will be there when you next visit will very much depend on what has turned up on the van or has been donated. No doubt Tess and her team will think of something fun and worthwhile and sell it at a very reasonable price. I really enjoyed meeting Leon, Tess and their teams. I came out with a feeling of hope. In our days where people who are different struggle to integrate and funds to help such projects are dwindling, I saw smiles and hugs, heard laughter and banter and witnessed something that seems far too scarce. Nurturing and empowering for the benefit of us all. I’m very glad Billy asked me to meet them all.